The University of Nevada, Las Vegas’ Office of Economic Development is working to finally capitalize on years of research and development programs that have resulted in successful patents. COURTESY Zachary Miles, attorney and associate vice president for economic development at UNLV. 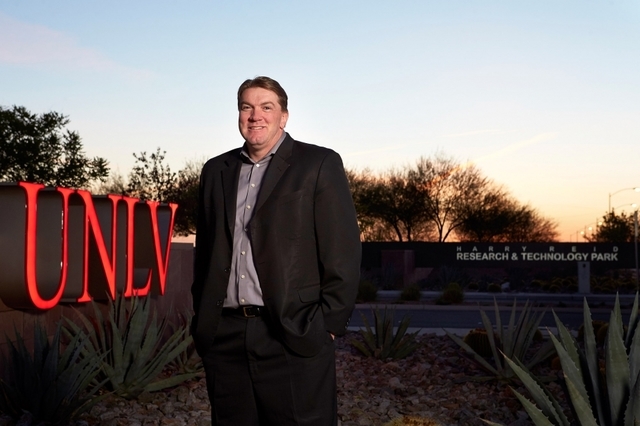 Most longtime Las Vegas residents may not realize that UNLV even engages in research activities. “You could have told me they owned a unicorn and it would be just as believable.” said Bob Glennon, a 40-year resident of Las Vegas and managing partner of Las Vegas Sign and Flag. The fact is that since 2009, UNLV’s staff and students have applied for and been awarded 179 patents, according to a report compiled by Zachary Miles, attorney and associate vice president for economic development at UNLV. “Prior to 2009, nothing existed in the way of records for tracking patents owned by the university,” said Miles, who came on board in December 2013. After organizing his department, Miles, who spent 10 years at the University of Utah in the technology commercialization office, began contacting with his network of individuals and organizations to track down current and future users of UNLV’s patent portfolio. “We only have two or three technologies that are generating funding right now,” Miles said. Miles connected with UNLV’s International Gaming Institute to compile a list of low-hanging fruit, such as software programs that were developed by the university and are being used in gaming applications. The next step was to sign agreements to collect revenue on UNLV’s intellectual property. In fiscal year 2013, which ended June 30, 2014, revenue from that low-hanging fruit amounted to $32,281. Up until 2013, the university received zero dollars for its intellectual properties, but FY 2014 saw revenues climb to nearly $58,000. The revenue more than doubled to just more than $126,000 for FY 2015 and then doubled again in FY 2016 to over $252,000, according to a UNLV report. This year, UNLV received $53.3 million in funding from federal grants, federal pass-through accounts, the state of Nevada, private industries and foundations and local businesses. This funding allowed for the continuation or startup of 389 research projects. The UNLV International Gaming Institute averages about 15 disclosures each year. A disclosure is a document that announces a potential discovery or modification of an existing product or process that could result in the filing of a new patent. The Institutes’s Center for Gaming Innovation enables students to create intellectual property, including casino games and innovations that have generated more than 30 patent applications to date. These patents and licensing agreements make up the majority of the $252,000 in revenue. The products are just starting to hit casino floors, according to a UNLV report. But gaming is not the only research area benefiting from grants. Recently, UNLV filed a patent on behalf of Zhiyong Wang, associate professor at the Howard R. Hughes College of Engineering. Wang and his son developed a process that can increase the strength of a diamond by 5 percent. Even though a diamond is the hardest naturally occurring substance found on Earth, it falls into the “crystalline solid” category, possessing microscopic defects, fault lines, dislocations, occlusions and inclusions that are points of weakness. The discovery made by Wang and his son is that when diamonds are immersed into a low-temperature — below 212 degrees Fahrenheit — plasma environment on a vibrating surface, the plasma fills the voids and chemically bonds with the carbon elements of the diamond, thereby increasing its crushing strength index by at least 5 percent. While the strength of the crystalline structure of a diamond is of no importance to the jewelry industry, the majority of diamonds mined are used for industrial purposes. Small diamond particles are embedded in saw blades, drill bits and grinding wheels. The strength of these diamond particles determines how many times a bit, blade or wheel can be used before its abrasiveness wears out. Miles is working with his contacts to sell this patent process to manufacturers of diamond-embedded cutting tools to monetize this intellectual property. Miles also has reached out to UNLV’s Center for Entrepreneurship to build a business plan around the process and promote it to industry. UNLV, like most universities, encourages research and development but retains the rights to intellectual property. The Bayh-Dole Act of 1980 permits a university, small business or nonprofit to pursue patent ownership of an invention, even though the research may have been funded using government money. The act also specifies a reasonable split of the proceeds with the researchers. UNLV is very generous to its research staff, allocating 60 percent to inventors; the norm at most public universities is 30 to 40 percent. The university department with the patent receives 25 percent of the revenue, while the remaining 15 percent is retained for administrative purposes, Miles said. While UNLV has not had any truly life-changing patents to date, research is ongoing in two different areas that could put the university on the map. One research team just developed a compound to prevent the Clostridium difficile bacterium from germinating and spreading. Often referred to as C. difficile or C. diff, this bacterium can cause symptoms ranging from diarrhea to life-threatening inflammation of the colon and most commonly affects older adults in hospitals or in longterm care facilities and typically occurs after use of antibiotic medications. Because of testing requirements by the Food and Drug Administration, Miles expects it to take about eight years before it becomes available for use. Faculty and students of the College of Engineering teamed with Lockheed Martin to test materials and protocols for their Orion project. The Orion spacecraft is being designed for long-duration, human-rated deep-space exploration and is expected to take astronauts to Mars and return them safely back to Earth. “This partnership will provide unique opportunities for our students to enhance their knowledge and research capabilities in exciting new areas and help accelerate the efforts of Lockheed Martin research activities and the nation’s ambitious space program,” said Rama Venkat, dean of the Howard R. Hughes College of Engineering.